← Product of the Week – Luscious Lithuanian Lollipops! In keeping with these times of financial crisis, double-dip recession, austerity and cuts, Product of the Week took on the challenge of ‘how far will a pound stretch on Walthamstow Market?’ A pound being a £1, a quid, 100 pennies, and at today’s rates: 1.2 Euro and 1.6 US Dollar. Well this week £1 offered several deals: massive red, white or green cabbages, a box of slightly bruised courgettes or 4 packets of heritage tomatoes that required a little TLC … but we went for a bowl of dark red plums. Ok, they’re not seasonal, but my head was full of ideas and I thought they would be comforting on a bitterly cold winter weekend. 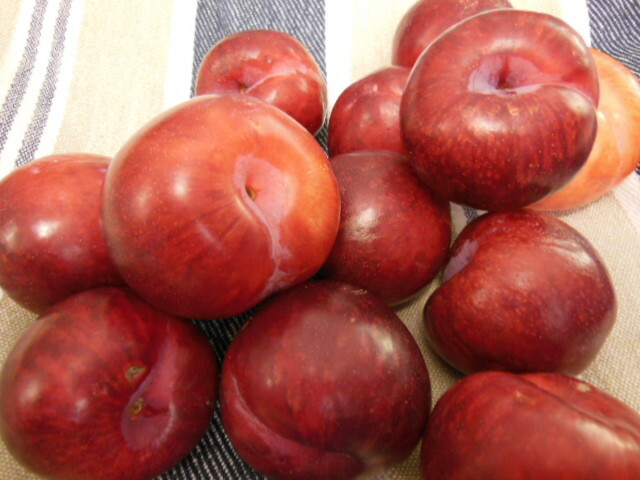 So what to do with a pound of plums? We decided on a plum and lemon cake, loosely adapted from my favourite recipe in Sophie Grigson’s ‘Sunshine Food’: Torta di Prugne. 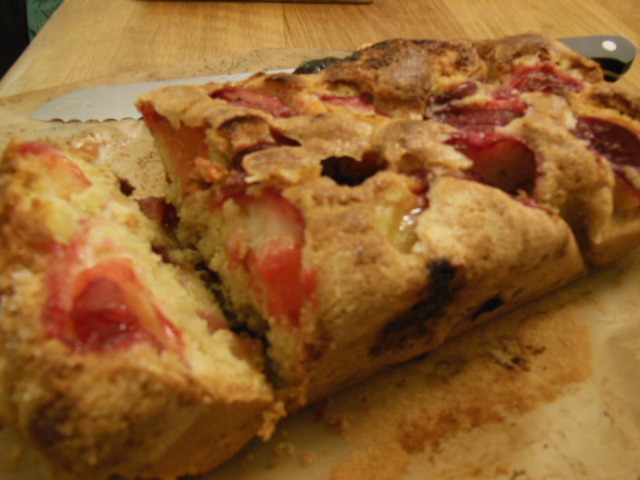 This is a satisfying, dense, rustic cake heaped with fresh plum pieces, which as they cook become lovely, sweet, jammy lumps. The sugar on top caramelises and gives the cake a toffee coating and makes it the perfect slice with a fresh cup of coffee. It is also really quick and simple to make. Mix the flour, baking powder and lemon zest in a large bowl. Whisk together the sugar and eggs until pale and creamy. 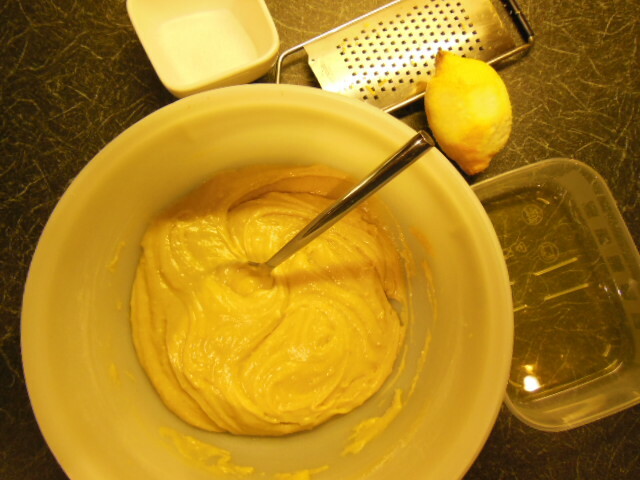 Add this mixture to the flour and fold in, gradually adding the olive oil until you have a smooth yellow cake batter. Line a 1 pound (there’s a theme going on here…) loaf tin with baking parchment, then spoon in about a third of the cake mixture. Wash the plums and slice into 6 pieces. Cover the layer of cake mix with a layer of plum pieces, then add the remaining cake mix. Randomly scatter over all the remaining plum bits, then sprinkle the cake with the reserved sugar. Heat the oven to 180C / 350F/ Gas Mark 4. Bake for 60-70 minutes until a skewer comes out clean. Leave to cool if you can and serve with custard or cream or enjoy with your mid-morning coffee. This cakes stays fresh for a few days, if it lasts that long. The rest of the plums went into a couple of jars of ‘make it up as you go along’ plum, apple and chilli chutney… that’s a recipe for another day. But that’s how far a pound of plums went this week. 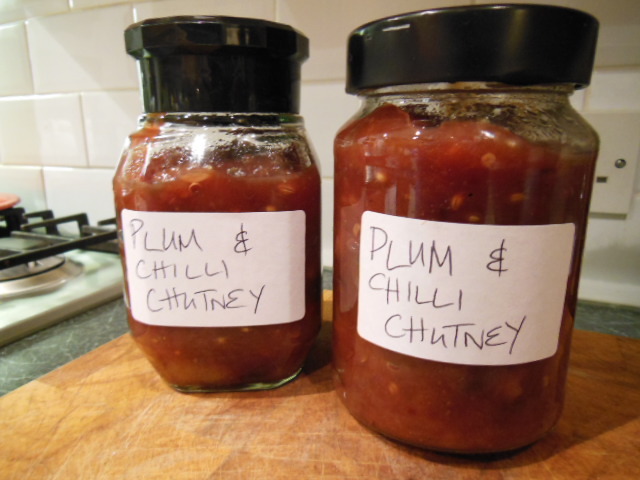 This entry was posted in Product of the week, Recipes, Shopping in E17 and tagged Apple, apple and chilli chutney, Cake, Plum, plum and lemon cake, plum chutney, pound of plums, Sophie Grigson, Walthamstow Market. Bookmark the permalink.